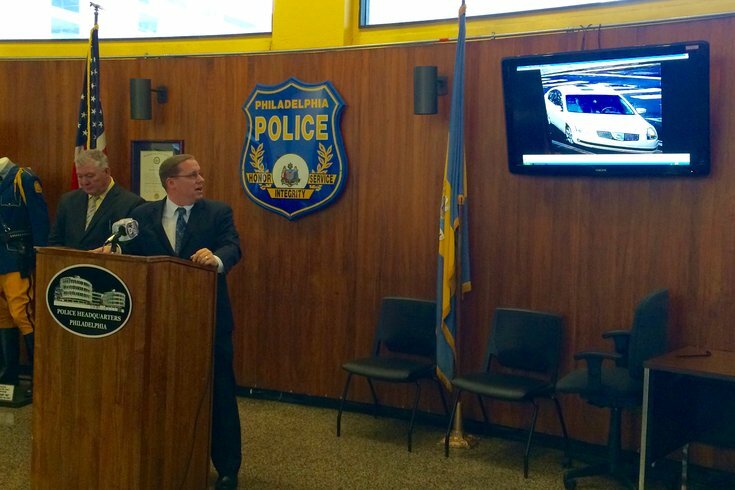 Lt. Dennis Rosenbaum of the Philadelphia Police Department's Northeast Detectives Unit shares video of a vehicle that investigators believe is connected to the New Year's Eve shooting of a 75-year-old woman. The woman was shot in face, but still returned home and put away groceries. Philadelphia police are hoping the public can help identify a wanted individual who shot a 75-year-old woman in the face before stealing her purse in Tacony on New Year's Eve. During a press conference to release surveillance footage taken from the incident, Lt. Dennis Rosenbaum, of the city's Northeast Detectives, said law enforcement officials hope that the public can identify the owner of the vehicle they believe is involved in this "heinous" crime – a white, 2004 to 2008 Nissan Maxima with a "sky view" sunroof. "We are really hoping someone will recognize the car," Rosenbaum said. "This was heinous." A distinct characteristic of the car, Rosenbaum said, is damage to its front grill, near the Nissan logo and damage on the passenger side. 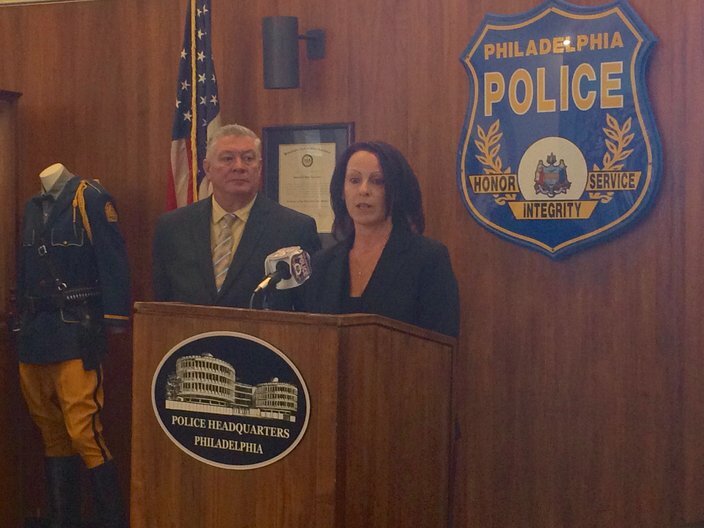 The shooting occurred on Dec. 31 at about 9:50 a.m., on the 7100 block of Montague Street in Tacony, Rosenbaum said. The victim, a 75-year-old woman who police declined to identify, had been walking home after shopping for groceries. Rosenbaum said police responded to calls from local residents who heard a gunshot. Officers found a pool of blood, and they followed a bloody trail from the alley between Erdrick and Montague streets to a neighboring street where they found the woman at home. It was no more than 10 minutes after she had been shot in the cheek, Rosenbaum said. She had gone home to put away her groceries, he said. "This is a tough lady. She wanted to get home and put her groceries away," the lieutenant said, noting the woman also refused to be taken to the hospital by ambulance and was instead transported in a police cruiser. Rosenbaum said the woman told police that while she was walking home from the store, a Hispanic or black male operating the Nissan Maxima ... pulled next to her and told her to hand over her purse. The victim described the shooter as being in his late 20s with a trimmed beard and wearing a red knit cap at the time of the shooting, Rosenbaum said. The woman refused to let go of her purse, he said. "During this course of action, she was shot in the face. It was nothing life threatening, though," he said. Rosenbaum said the bullet passed through the woman's cheek, and she also suffered some "bumps and bruises" from being dragged a few feet after the suspect grabbed her purse. Edie Ritchie, who identified herself as the daughter of the shooting victim, said on Thursday that her mother, who works in the office and with special needs children at Philadelphia's Edwin Forrest School in Mayfair, is "doing well" following the incident. "She's doing well, considering," Ritchie said. "She's a tough lady." Ritchie said the shooter held the gun close enough to her mother's face during the incident that the gun's barrel caused burns along the side of her mother's cheek. "It was right up against her cheek," Ritchie said. She hopes the video footage from this incident will help track down the person responsible for the "brazen" daylight shooting. "It was very brazen, I'd say," she said. "It was in broad daylight. Hopefully ... we can get this guy off the streets." Anyone with information is urged to call Philadelphia police at 215-686-8477 or text a tip to 773847. Tips can be sent anonymously to police online here.